Download per IP Limit reached. Please wait 24h or reconnect. 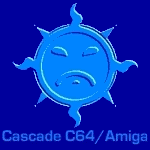 Here you will find many of the Cascade Amiga demos, that made the group famous on Amiga between 1988 the 1991. The downloads below are of file types (.zip, .dms, .adz or .adf) that can be used with WinUAE emulator (see below). Just "drag'n'drop" the files into the emulator window. 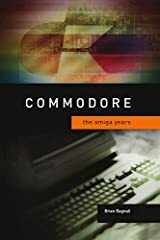 Keep in mind, that Amiga emulators will need a kickstart rom. More info here. This demo was done by Whee from the danish Cascade division. Music is made by MML/Cascade (aka Liquid). 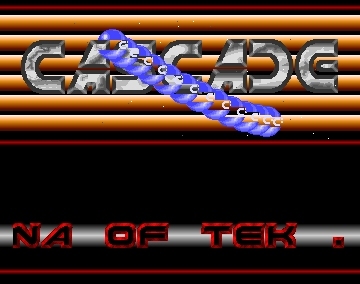 This nice demo, done by the Cascaders Sweden, contains two parts, that were supposed to be in megademo but released separately after the megademo was canceled. 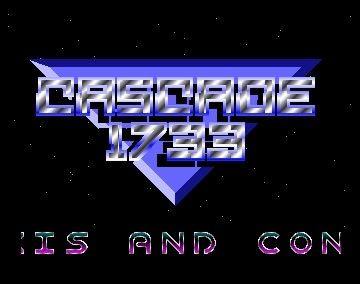 Cascade introduces their new BBS called Icehouse, with this nice demo. This brilliant dentro was once again made by the guys in Sweden. 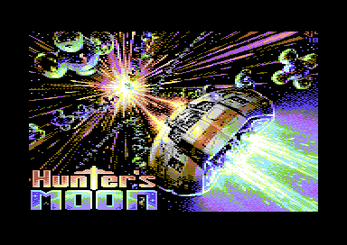 Could also be nice (but hard) to port this demo to C64. Fine demo by Distance and the guys from Sweden, introducing the Cascade BBS called "Search & Find". Little "we are still alivetro" in cooporation with Marcorossi of Tdc Artworx, who supported the graphics. Music by Hurricane/The Link. 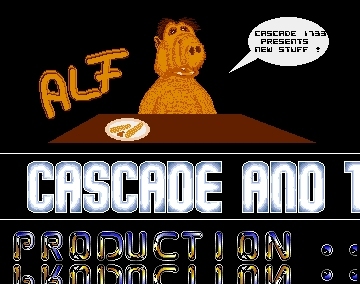 Very nice demo/intro done by da cool Cascaders from Sweden. 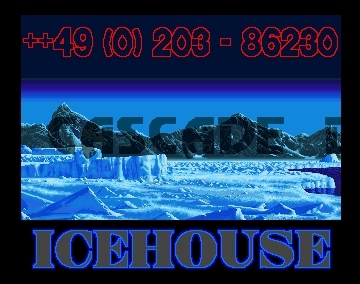 This nice, little contact demo was made by division from Holland. The demo name itself is unconfirmed. It's also stated, that this demo was made by using the RSI Demomaker. 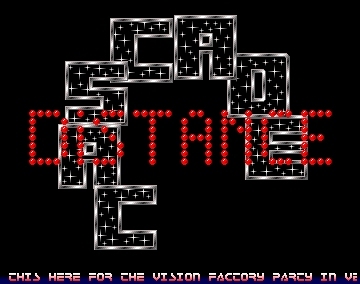 This nice Intro was done by "Distance" for the Vision Factory Copy Party. 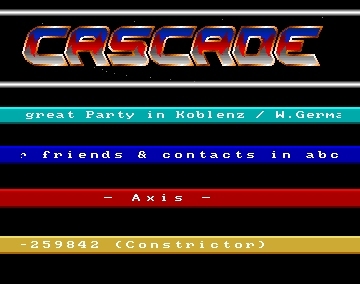 This Intro was done by the guys from Cascade Germany, to announce the new American Section and the US BBS. 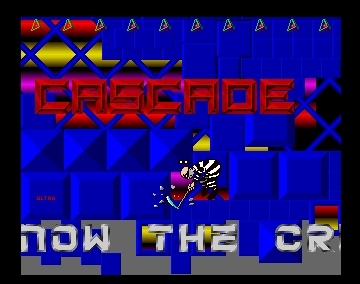 This demo was released on the Piranhas Copy Party and it was done by "Touchdown", a subgroup of Cascade. Nice one by Distance. 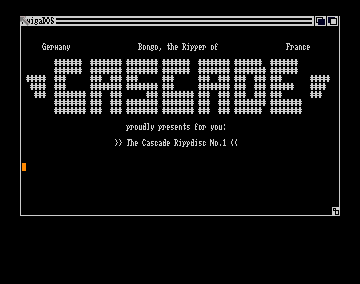 Cascade Germany says welcome to their new members from Denmark and France. Cool music by Banana/TEK. In this demo Dynax and Ultra announce that they start to code a game. 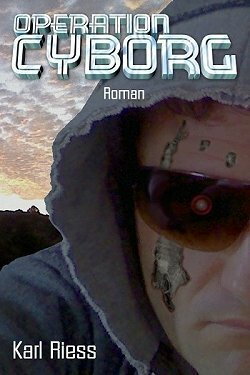 Would be interesting to know, if this ever was finished... Music in this production was made by Static/Rebels, font by Terminator/Tristar. This ist the first appearance of Cascade Sweden and already shows the great potential of this busy division. 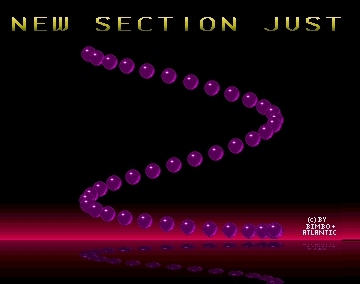 This production is a collection of demo parts, that were supposed to be linked into a megademo, which was cancelled in the end. 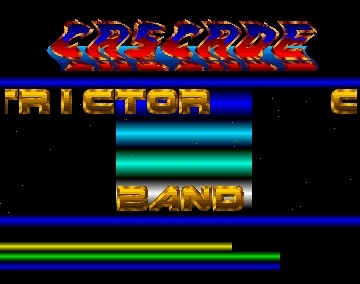 All parts were coded by Crackline/Dynax, with some of the graphics made by Skatemaster. 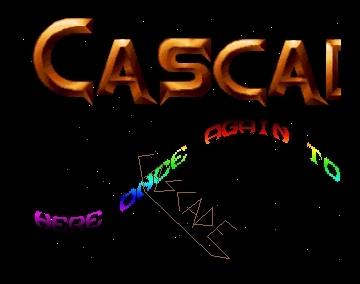 Musics and some of the fonts are from various (non-Cascade) artists. Release year is guessed. 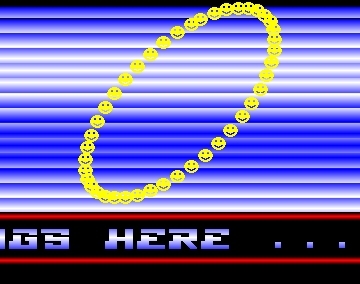 Besides there is an according directory stamp, it is mentioned in one of the parts that this should have been the third megademo, so it should probably have been the successor of "Megademo 2" from Distance (see below), which was made in the very end of 1988. 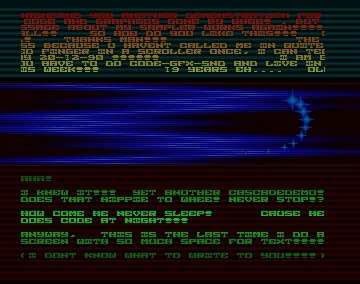 In the part "Defect Radio" the scroller stalls after a short while, so the part might be damaged. 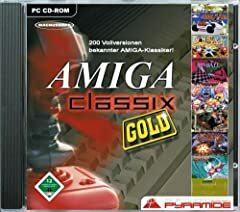 Chipset: OCS/ECS - please take Kickstart Rom 1.x. I had some problems with Kickstart 2 (Recoverable Alert). Nice stylish intro by the Cascaders from Denmark. 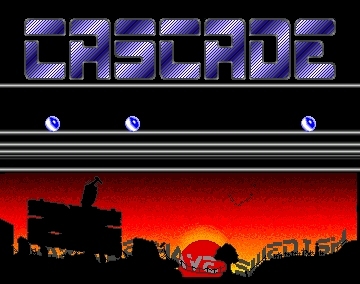 This megademo is the first demo for Cascade by Distance after joining and I (Zeldin) must say it's an impressive debut! Distance did a great job, coding all these nice parts and effects! 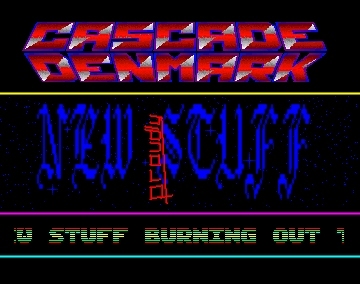 First Intro/Demo from Crackline for Cascade. Music by Drake/Vortex 42, font by Ming/The Knight Hawks. Little demo by Bruce, containing info about Axis and Constrictor leaving Cascade. I don't know much about this release. 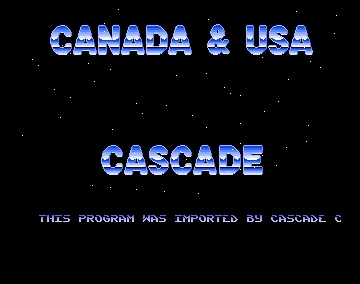 The scrolltext is stating that it is an import by Cascade USA and Canada. 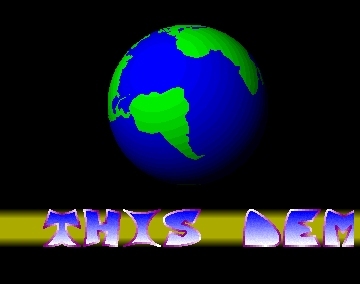 Afaik the slideshow itself was part of Deluxe Paint 2 (as show case for the program's abilities). Presumably the whole thing was imported to Europe and then linked with an Cascade intro by Simon and Ronny. 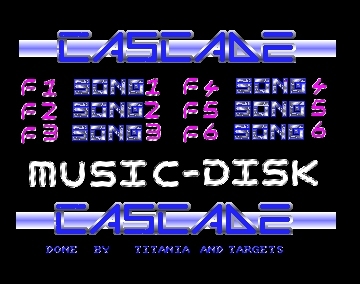 Musicdisk / music collection, sampled by Bongo, containing musics by Karsten Obarski and different other scene musicians. 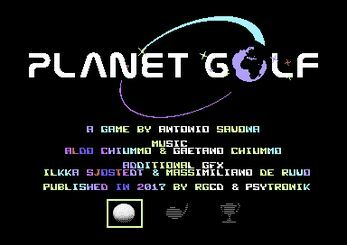 The according intro is listed here with an own release.